The red knot (Calidris canutus) belongs to the family of knots, curlews and snipes, the Scolopacidae. The red knot is distributed in North America, South America, Europe, Africa, Asia, Indian subcontinent and Australia. The knot species is fully migratory. This knot species is polytypic. The red knot (Calidris canutus) is a large-sized knot, measuring 20 to 25 cm in length and weighing 80 to 220 grams. The wingspan is 45 to 55 cm. The adult breeding red knot has mottled gray crown and upperparts. The face, neck, throat, breast, belly and flanks are reddish brown. There is a blurred lore. The rear-belly is whitish. There is varying levels of redness among the subspecies. The wintering birds have pale gray upperparts and whitish underparts. The molting to the basic or the alternate plumage occurs mostly during their migration. The dark tapering bill is thin. The short legs and feet are gray. The irises are blackish. There is a whitish eye-ring. The red knot call is a repeated, plaintive monosyllabic "knutt" or a disyllabic "knuup.. knuup" sound. The red knot is distributed in North America, South America, Europe, Africa, Asia, Indian subcontinent and Australia and surrounding islands. The nominate red knot subspecies C. c. canutus is distributed in central and north Russia (Siberia, Taymyr Peninsula and Yakutia). This subspecies winters in west and south Africa and southern Asia. The knot subspecies C. c. piersmai is distributed in New Siberian Islands (Russia). This subspecies winters northwest Australia. The subspecies C. c. rogersi is found in Chukotskiy Peninsula (Russia) and winters in Australia and nearby islands. The red knot subspecies C. c. roselaari is distributed in Wrangel Island (Russia) and northwest Alaska (USA). It winters in coasts of north Venezuela, Panama and southeast USA. The subspecies C. c. rufa breeds in low Arctic Canada and winters in south America. The subspecies C. c. islandica breeds in high Arctic Canadian islands and northern Greenland and and winters in western Europe. 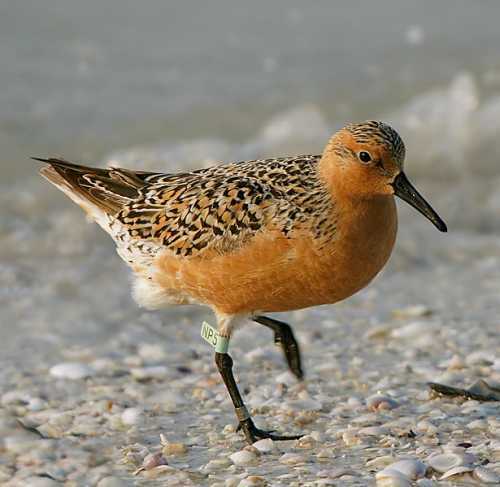 The Important Bird and Biodiversity Areas (IBA) of red knot in USA are, Delaware Coastal Zone, Cape Lookout National Seashore, Cape Hatteras National Seashore and Delaware Bayshore Region. The IBA in Russia are, Tyk and Viakhtu bays, Ola lagoon, Nevskoye Lake, North-east Sakhalin lagoons, Aniva bay, Moroshechnaya River, Kuril islands and Lesser Kuril Ridge and Kunashir Island. The IBA of the red knot species in Argentina are, Sistema Península de Valdés, San Antonio Oeste, Reserva Costa Atlántica de Tierra del Fuego y zonas adyacentes and Bahía de Samborombón y Punta Rasa. The red knot species do not normally occur in forests. They normally occurs in altitudes between 0 to 300 meters. 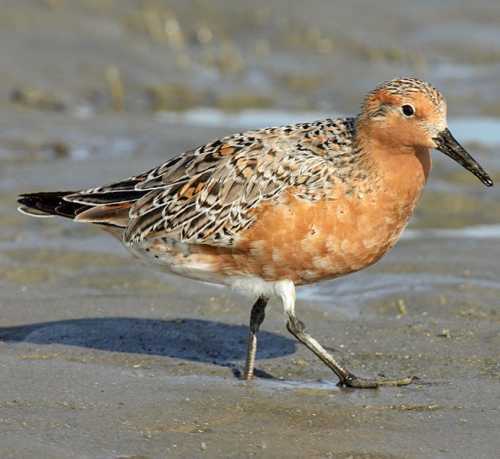 The natural ecosystems and habitats of these knot species include tundra grasslands, tundra wetlands, tidal flats, shorelines, estuaries, tide pools, marine lakes and coastal freshwater lakes. The diet of these red knot species consists mainly of invertebrates. Insects, larval insects, beetles, ants, termites, spiders, crustaceans, molluscs, worms, grass and sedges are their primary food. The breeding season of these red knot species is during May and June in most of their breeding range. These birds are monogamous and nest solitarily or in small groups. The knot nesting sites include low-lying, shrubby tundra, close to marshes, lakes, pools, rivers, moist marshy slopes and flats in foothills. The nest is an open shallow depression on hammocks or on stony or gravelly ground. The nest is usually built by the male. Sometimes it is lined with plant matter and moss. The clutch contains four pale cream eggs, with dark blotches. Both the red knot parents incubate the eggs. The chicks hatch out after 22 days. The female leaves the chicks before their fledging. The males leave, once the young have fledged. The juveniles make their first migration on their own. These red knot species are fully migratory birds. The breeding populations are found in Arctic and subarctic North America, Europe and Asia. They migrate to the wintering grounds in August and September. These knot species return to the breeding grounds in early Arctic summer. They travel in stages through a few stop-over sites during their movements between breeding and wintering grounds. Diet and feeding habits: insects, beetles, spiders, bees, crustaceans, molluscs, worms. The global population size of the red knot (Calidris canutus) is estimated at 891,000 to 979,000 individual birds (Wetlands International 2015). The overall population trend of the species is reported to be decreasing. In most of its range, this knot species is reported to be common to locally common. The generation length is 6.8 years. Its distribution size is about 17,800,000 sq.km. Ecosystem degradation, ecosystem conversion, severe weather, climate change, pollution, sport hunting and susceptibility to avian influenza are the main threats that may endanger the survival of the knot species. The red knot (Calidris canutus) species is approaching the thresholds for being Vulnerable under the range size criterion, under the population trend criterion and under the population size criterion. 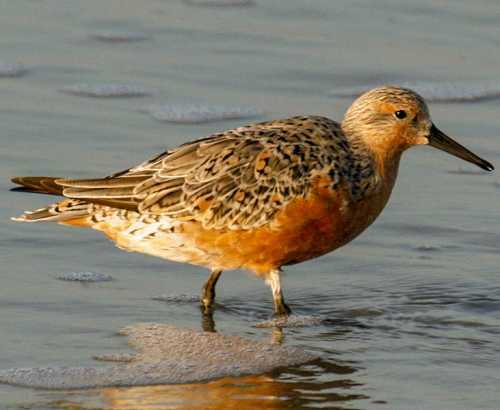 The CITES (Convention on International Trade in Endangered Species of Wild Fauna and Flora) status is ‘Not Evaluated’ for the red knot (Calidris canutus). The red knot (Calidris canutus) is closely related to the great knot (Calidris tenuirostris). C. c. piersmai Tomkovich, 2001. Recently updated and current topic in Bird World: Red knot - Calidris canutus.